When a group of divers traveled to the Farne Islands off the coast of England for an annual diving trip, they never expected that they would end up cavorting with a group of friendly Atlantic Grey Seal pups. The Farne islands are home to a huge seal colony -- more than 1,400 pups are born on the islands each autumn -- and the group captured these seals unabashedly approaching them, looking a lot like canine puppies eager to play. The behavior seen in the video, rarely seen by humans, is not unusual for young seals in groups. According to Sue Wilson, chairperson of the Seal Conservation Society, seals don't engage in much social interaction when they are on dry land. But it's a whole new story in the water, where they engage in prolonged play -- rolling and twisting around each other in continuous contact, often putting their flippers around each other. "The behavior seems to be all about creating and maintaining social bonds within the colony," says Wilson, who added that by about six months, pups start playing with each other like the ones in this video, which she guessed were about one to three years old. The video appears to be capturing the seals "transferring their normal behaviour to the divers" -- surprising, she says, because pups are usually much more wary of humans. From the video, it's hard not to think of canine puppies -- especially when they seem to enjoy belly rubs and chins scratches from the divers. But do they really enjoy being scratched, like a dog would? Kelly Froud, a Marine Biodiversity Officer with the Hebridean Whale and Dolphin Trust, says yes -- but maybe not for the same reason. When a pup is nursing, she says, the mother seal will often scratch the pup. "This could be to aid the molting process, to loosen the fur or perhaps it could be a sign of affection," she added. "Perhaps this is why the seals in the video are so keen to be ‘petted.'" But they're potentially a lot more dangerous than canine pups -- and experts advise against interacting with them like this. "They have sharp teeth and strong jaws that could most certainly do some damage, but aside from that, they do harbor many infectious diseases that as humans we would definitely not want to get," says Froud. "For that reason it is advised that humans do not get too close." She added that getting close to seals may make them lose their natural fear of humans and, in turn, make them less afraid of hunters or fishermen who see them as a threat to their fish stocks. This hunter got a big surprise when a pup decided to jump up onto his boat -- and onto him. And in this video, a baby elephant seal in Antarctica actually crawled out of the water to investigate some bewildered people on the shore. 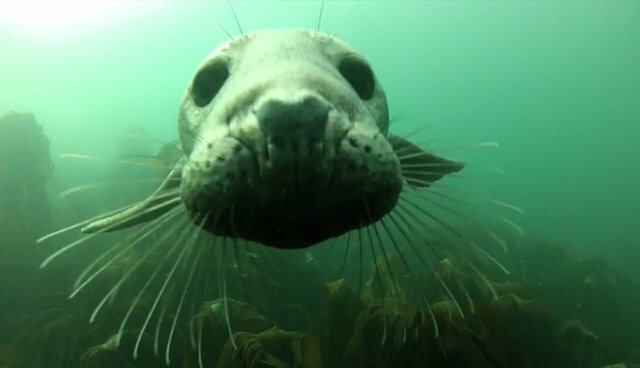 Even on land, seal pups can be pretty curious (and cute).